There's more to her than being The Pickiest Eater's wife. Read her blog and you'll find out why. She writes no-nonsense posts that most newbie bloggers do. Well, when I was a newbie blogger (newer for that matter, 'cause I feel I'm still new on this), I write too personal things that I'm sure some people won't care about (not that I care about what they will say hehe). 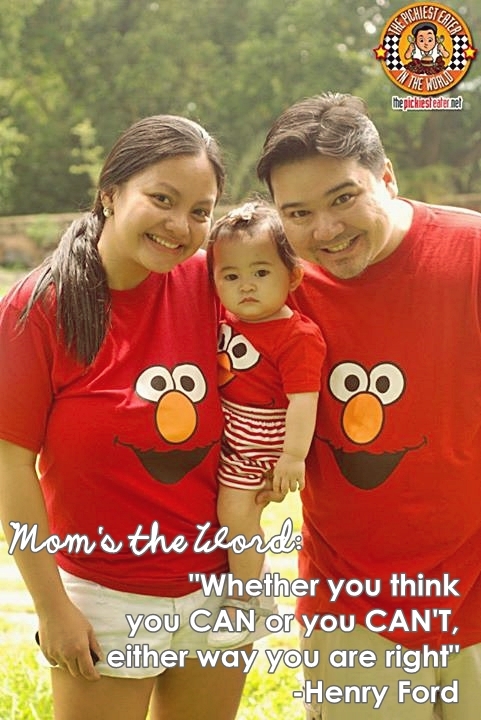 But this mom knows what a blogger should do: inform, inspire and entertain. Perhaps, the husband trained her well. A plus point for her, as a blogger, is that she takes good pictures. And her subjects are always pleasant. One of those is her cutiepie Elmo-lover Rain, her curious toddler who had an accident by the time of this interview. I will leave the story-telling to the mom. Let me just lead you to my 25th mom's answers to my AML "slumbook". 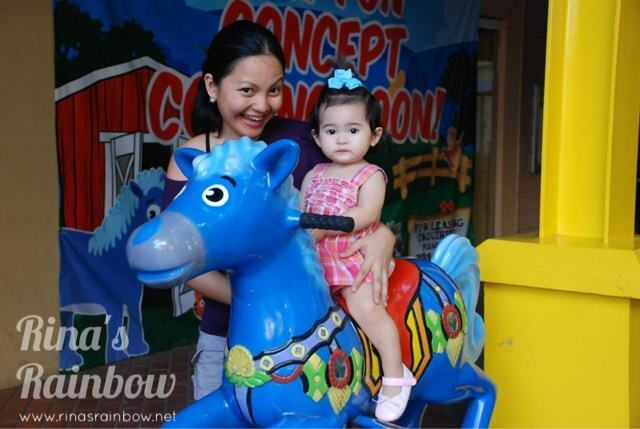 Royalties, meet this sweet and sassy mom blogger behind Rina's Rainbow. CHILD, AGE: Rain, 21 months. Turning 2 years old in October! Yikes! FAVORITE OUTFIT: Nowadays, I like wearing oversized shirts. Something that doesn't hug my body to show my built-in lifesavers (salbabida) but at the same time is flattering. MUST-HAVE BEAUTY COSMETIC: My Maybelline New York Clear Smooth Aqua Gel Foundation (phew! That's a mouthful! )and Cherry Maybelline lip gloss. I’m not into make-ups so much simply because I don’t know how to haha! A simple foundation and lip gloss is fine with me. HOBBIES: Hmmm... aside from playing with Rain and taking people shots, I actually like hanging out at a coffee shop to blog. Sounds mainstream, I know. But I actually quite enjoy the combination of a yummy cold frap and writing. CURRENT READ/WATCH: SuperBaby by Jenn Berman. It’s a really good book for moms especially for first-timers like me. It helped me understand my baby and gave me a different perspective on teaching my toddler. Though honestly I haven’t had the time to finish it yet. Yes I’m a slow reader haha. FAVORITE DOMESTIC DUTY: Nothing, really. But if I were to choose one I guess I would have to say doing the laundry. There’s something therapeutic about hanging clothes to dry and watching them dry under the sun. I’m weird. GUILTY PLEASURE: Magnum Chocolate Truffle. I always fight the urge to buy one whenever I’m doing my grocery. PET PEEVE: Off the top of my head, people in line with no sense of personal space. There was one time I was lined up at the counter of a grocery store and this lady behind me was so close to me that I could literally feel her chest touching my back. What’s up with that?!? Oh, and people posting blurred photos even when there’s an auto-focus feature on their cameras hehehe. Bebeng says: I agree with that! Do they think they will reach the end of the line faster if they would let us smell their scent?! Irritating. That's why if I can avoid riding the train, I would. I don't want being too near with people I don't know. It's just scary. But with the blurred photos, can I say sorry? I'm guilty! Hihi. 2013 GOAL: To make sure I teach Rain well with what she needs to be learning at her age. And my goal for my blog is to have at least one personal blog post make it to my top popular posts. Not an event. Not a sponsored post. Not a giveaway. Here’s hoping! Bebeng says: I'm with you on that. Remember when I told you I have one non-giveaway post on top three? The last time I checked, it's now on 7th. And the rest was about my Willie Revillame-ish posts. Hehe. DREAM FOR RAIN: For Rain to grow up to have a positive outlook in life. I want her to have good self-confidence. I want her to do a job that she loves so that she won't ever feel like she's working. And most of all I want her to be God-fearing and help others in any way she can, even in just a small way. And this other quote below, when I'm feeling down, it helps me remember that these negative things I might be encountering now are actually happening for a reason. They could be broken roads that will lead to a happy ending. "Everything will fall right into place."